NCS produces and distributes Street Sheets, a pocket-sized guide to free meal programs on the Upper East Side and other resources throughout the city. Thousands of these guides are handed out annually both at meal programs and other community centers and by individuals interacting with people on the street. 31% of homeless individuals in NYC identify as Hispanic/Latino, and NCS is now able to provide these helpful guides to those more comfortable with Spanish. 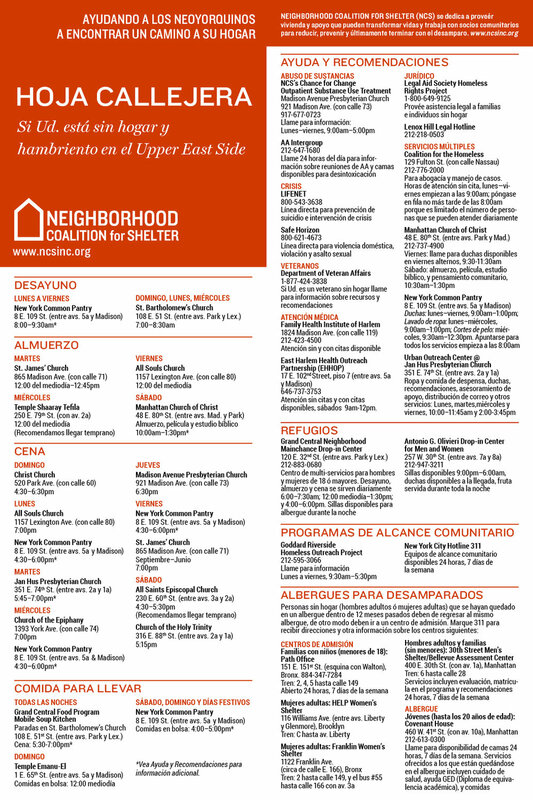 To download and print copies of Street Sheets in Spanish, click here, and for English, click here. Coming Soon: Street Sheets for the Upper West Side! Check back soon for more information.